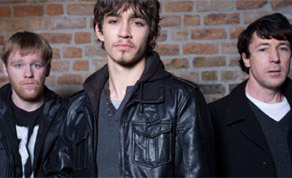 RTÉ's gangland drama, ‘Love/ Hate’ has won the Cinéma Tous Ecrans (CTE) Best Series Award. Directed by David Caffrey (Divorcing Jack, Raw) the series also recently completed an international distribution deal with ITV Global. Produced by Octagon Films, ’Love/ Hate’ looks to reflect life in modern gangland Dublin. Written by Stuart Carolan (Raw, Little White Lie) it stars IFTA winning actor Aidan Gillen (The Wire) alongside Robert Sheehan (Cherrybomb), Ruth Negga (Breakfast on Pluto), IFTA winning actress Ruth Bradley (Stardust), Briain Gleeson (Noreen) and Killian Scott. Geneva’s CTE is held annually in the city’s centre and has been running since 1995. The event looks to bring together television, film and multimedia makers and their respective projects. ‘Love / Hate’s win at the festival follows on from a Best Drama nomination at the Prix Europa Awards in October. ‘Love/ Hate’s makers also recently completed a distribution deal with ITV Global and the group will now look to bring the series to international audiences. Irish audiences gave the series a stamp of approval when it broadcast here in October; the average audience for the Sunday night broadcast came in at 453,000 with the repeat showing on Thursday evenings and RTÉ iplayer facilities attracting an audience of a further 203,000. Further examination of the series’ ratings revealed a significant increase over the usual slot average among young men in particular. The series is produced by Simon Massey, Suzanne McAuley (A Shine of Rainbows) and James Flynn (P.S. I Love You). Shot on RED by Donal Gilligan (The Boys of St Columb's, Dead Bodies) the production design is by Stephen Daly (Breakfast on Pluto) and costumes are by Aisling Wallace Byrne. Editing was carried out by Dermot Diskin (Kings, Boy Eats Girl). Production Depot supplied camera facilities whilst Teach Solais supplied lighting.